Despite conservation efforts in some areas, it has continued to shrink rapidly since, with a further 19 per cent lost in four years (2005-2009) from the key remaining grassland area in the southeast of the Tonle Sap floodplain. Factors include intensive commercial rice farming with construction of irrigation channels, which is often illegal. Some areas have also been lost to scrubland where traditional, low-intensity agricultural activity has been abandoned. The research has been led by Dr Charlotte Packman from UEA’s school of Environmental Sciences, in collaboration with the Wildlife Conservation Society Cambodia Program and BirdLife International. It was funded by the Critical Ecosystem Partnership Fund. Dr Packman said: “Tropical and flooded grasslands are among the most threatened ecosystems globally. The area around the Tonle Sap lake is the largest remaining tropical flooded grassland in Southeast Asia. It is hugely important to both biodiversity and the livelihoods of some of the world’s poorest communities. Our research shows that these grasslands are disappearing at an alarming rate. 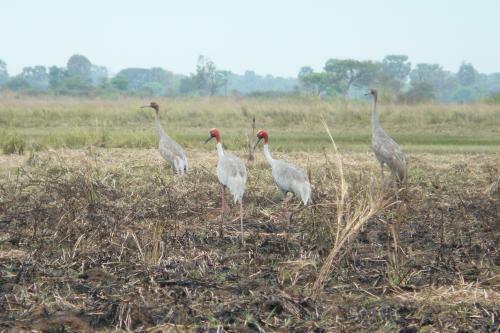 The seasonally flooded grasslands around the Tonle Sap, Southeast Asia’s largest freshwater lake, are of great importance for biodiversity and a refuge for 11 globally-threatened bird species, including Sarus Cranes. 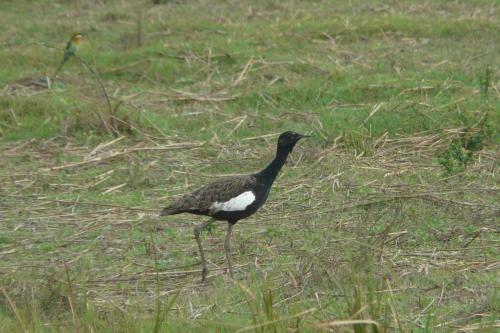 Credit: Dr. Charlotte Packman / University of East Anglia “These unique grasslands are home to many threatened birds including by far the largest remaining population of the critically endangered Bengal florican – the world’s rarest bustard. This bird has experienced a dramatic population decline of 44 per cent in seven years due to the destruction of its grassland habitat. Other birds under threat in this area include sarus cranes, storks, ibises and eagles. “Rural communities have been left vulnerable to land-grabbing and privatisation of -communal grasslands. Traditional, low-intensity use of the grasslands by these communities, such as burning and cattle-grazing, help to maintain the grasslands and prevent scrubland from invading. Researchers compared aerial photographs taken in 2005 with land cover maps from 1995 and 1996. They found that the greatest losses had occurred in the north and west and in inner floodplain areas. The least affected area was in the southeast of the floodplain. They then collected habitat information from almost 1,000 points to establish the rate of habitat change between 2005 and 2009 in the largest remaining area of grassland. This showed that grassland in the key southeast area had declined from 923 km² to 751 km² in just four years.